The slugs (or snails as I more often see in my garden) like my Violetta Pac Choi as much as I do, it seems. An old spaghetti sauce lid full of an IPA some one left at our house. Stouts, wheats, and other Other Half Approved Brews don’t make it to the garden. Thankfully our friends are a diverse crowd and I usually have a misfit beer on hand. Of course, if you’re less squeamish than I, there’s always the seek and squish method. It’s seed sowing season here in Central Texas. We’re approximately 10 weeks away from the average final frost date. Approximate, because it depends a fair bit upon one’s location relating to “town bubbles” as well as possible elevation and other microclimate factors. Not to mention the conservative approach versus the riskier approach – which is an entirely personal decision. I like to start my seedlings indoors when possible, as early as possible. If I start them earlier, and am unlucky with my germination, I may have time to try again. At the least, the local nurseries won’t be sold out forcing me to buy from a big box store if I want plants of that type. This year, right after planning my garden plot on some graph paper, I re-reminded myself on the date to plant or sow relative to the the Average Final Frost Date here. Risky, or conservative (depending upon to whom you talk) I call the FFD in my neighborhood March 15th. If the 10 day weather forcast is looking lovely on March 8th, I’ll put seeds out early. If it’s sketchy, I’ll hold off. With my memory refreshed, I started my timeline. March 15th, minus ten weeks, is approximately January 5th. So I’m a week early. The plants will merely be a week bigger. 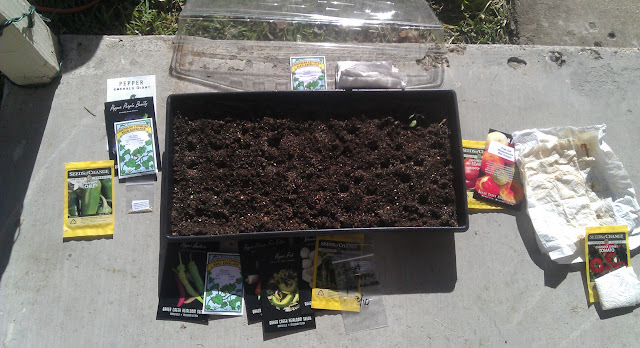 Some folks are talented and resourceful enough to make their own seed starting mix. I have yet to dive into that project. Instead, I keep an eye out for off-season sales. The bag shown had four friends just like it, at the grocery store of all places. This tray has five seeds per circle laidout as a square with a dot in the middle. Forty Australian Brown Onions and forty Violet de Galmi. I don’t have a historically successful time with onions, so I thought to plant in excess and succeed at least a little that way. Sown on the 28th, I hope to see sprouts next week. 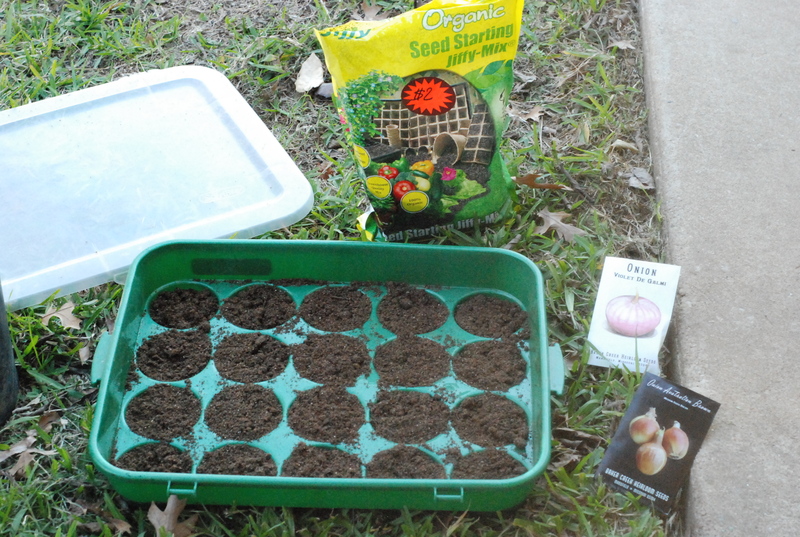 Today’s sowing was peppers, tomatoes, and their relatives. This is an actual seed tray, same mix. You can just see the indentation of my finger making spots for each seed. I lay the seed packets out in order of sown row. Then after I’m done, I sketch the seed tray with dots representing each seed, and label accordingly. This is how I will tell which seeds germinated well, which seed sources may gain more of my business, and also simply so I don’t end up with a tomato wishing to grow 8 feet tall in a pot where I thought I put a 2 foot variety. Have you started any seed trays? Do you plan to? Or is it too soon in your area? I had a lazier garden day, today. I found a free manure source on Craigslist whom I need to call. I checked on the lettuce transplants (most appeared happy, a few weaker ones may not recover.) I assembled the latest weed eater, edged both front yard sections, the walk, and whacked around the garden boards. I spent a spell sitting on a crossbeam spanning the turned earth, munching almonds, and watching the soil. Overturning a spot of leaves with a twig revealed an acorn. Setting down my stick, I cracked the acorn. Carefully prying it apart, I could see hundreds of tiny insect eggs. I laid both sides egg-side up on my beam in the sunlight. I set about to find more acorns, disturb the eggs, and hopefully reduce spring infestations of detrimental life. 1) Acorns do not belong in garden mulch. 2) Weed eaters are an art form to utilize well. I require more practice, for following a concrete drive in a straight manner was never required in my country childhood. I ordered seeds last night for my next garden. Among the new varieties include melons, winter squash, and strawberries which are all new to me and my garden. Today I broke ground on adding another 50 square feet to my 5′ x 20′ bed. It’s wet and muddy work this time of year. The grass and weeds dislodge easily in the damp soil with my spading fork. The heavy clay clings to the prongs. Every few pries requires clearing the tool with the side of the sole of my shoe. After about 10 square feet. I’m ready for a different task. Digging a new bed is hard labor, and it’s been nearly a year since I last did the work. 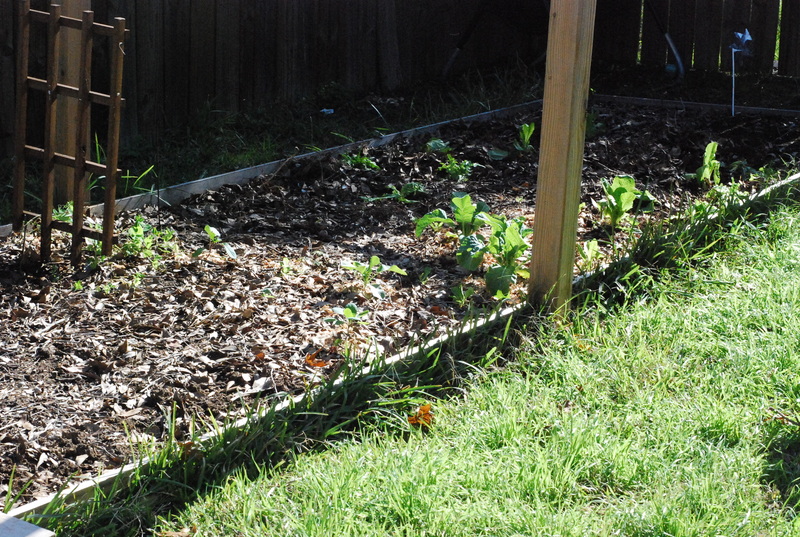 It will be nice to get back into “gardening shape” but it will take time, so 10 square feet at a time is it for now. I moved back to the rear fence to continue removing the vines that had taken deep root there. There had been a two foot span of earth, between a chain link fence and a privacy fence. It had come to fill with vines, leaves, and other debris over the last decade, I assume. My lovely other half had removed the chain link two weeks ago and begun removal of the hackberries and more intertwined vines. He was busy wrestling, literally, with a toilet repair project so I thought to lend a hand. I finished by using my new Hori Hori to uproot a handful of volunteer Red Romaine, Green Oakleaf, and Black Simpson heads to move the out of harm’s way (in the path of the garden plot expansion) and into the garden. After cleaning my spade, spading fork, and hori hori, it was time to go indoors for a snack of diced strawberries and yogurt. Do not compost tomato plants (oops!) Apparently the diseases that afflict tomato plants build up in the garden over time. Best to burn or toss. Squash bugs are as hard to kill organically as I’d come to discover. Well, poo.